Named for the closed kick pleat it sports in the back. 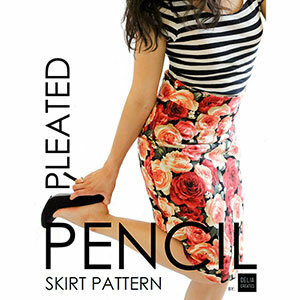 This high-waisted, knee length pencil skirt gently hugs the hips, slightly forgives the waist, and tapers in at the knees to create a flattering yet modest silhouette. It zips up at the side with an invisible zipper and is fully lined, giving you a professional looking finished skirt. 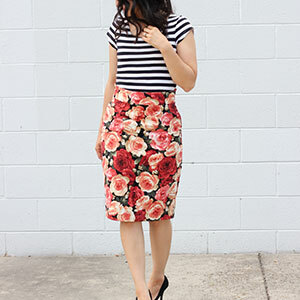 Delia also has a great tutorial on making this skirt in a knit! 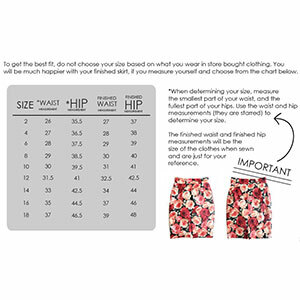 This pattern comes with sizes 2 through 18. Suggested fabrics are light to medium weight wovens such as crepe de chine, rayon challis, peach skin, denim, cotton lycra, cotton jersey, ponte de roma or wool.